Hare is the common name for small, fast-running mammals in the genus Lepus of the family Leporidae and order Lagormopha, characterized by long ears and legs, large hind feet, a short and bushy tail, and young born with fur and with eyes open. All other members of Leporidae are known as rabbits and are distinguished from the hares generally by shorter ears and smaller size, and by the young being born without fur and with eyes closed (Angerbjörn 2004). Also included in the Lagomorphs are the pikas in family Ochotonidae. Some true hares (genus Lepus) also have the common name rabbit, being known as jackrabbits. Some members of Leporidae outside the Lepus genus—notably the hispid hares of the Coprolagus genus and the red-rock-hares of the Pronolagus genus—are given the common name "hare" despite their being scientifically classified as rabbits. This article will be limited to members of the Lepus genus. Some of the adaptations that are so important to the survival and reproduction of hares also add to their value for the ecosystem and for humans. The hare's high reproductive rate makes them important components in many food chains as they provide food for such animals as foxes, raptors, lynxes, ferrets, and raccoons. The hare's fur has been important historically to the fur trade, their protein-rich meat is of culinary importance in areas of the world they inhabit, and their elusiveness adds to the delight of sport hunting. Hares are often featured in folk tales, but unlike the domestic European rabbit, they are not typically kept as pets. Hares, rabbits, and pikas comprise the order Lagomorpha, which is divided into two families: Leporidae (hares and rabbits) and Ochotonidae (pikas). Originally classified as rodents (order Rodentia), the lagomorphs are separated based on having a second, small, peg-like upper incisor sitting behind the first, large, continually growing incisor, whereas rodents possess only a single, upper incisor (Smith 2004). Also, lagomorphs have a single layer of enamel in the front incisors versus the double layer in rodents (Smith 2004). Lagomorphs have huge to relatively large ears, short tails (not visible in pikas), and cannot grasp food with their paws (Smith 2004). Lagomorphs have a very large digestive system, apparently adapted to digesting large amounts of plant material whose nutrient content is difficult to extract (Smith 2004). The caecum tends to be giant—up to ten times larger than the stomach—and it has a rich fauna of bacteria and other microorganisms that help to break down the plant matter (Smith 2004). Lagomorphs also practice coprophagy, whereby they eat their feces to undergo re-digestion and help yield up to five times as many vitamins as in the original food (Smith 2004). The Leporidae family comprises 11 extant genera and 61 species of hares and rabbits (Angerbjörn 2004) with one genus, Lepus, comprising all the true hares, while rabbits are classified into the other ten genera. Leporids all have long legs, long ears, and large hind feet, as well as a short and bushy tail. Each foot has five digits (one reduced); rabbits and hares move about on the tips of the digits in a fashion known as digitigrade locomotion. Hares tend to have brown or gray as the base of the soft fur, and usually have black markings on the fur of their ears (unlike rabbits). The large hind feet of the snowshoe hare, Lepus americanus, turn white during the winter (Angerbjörn 2004). Hares range in size from 40 to 75 centimeters in length (15.8 to 30 inches) and weigh between 1,350 grams and 6,000 grams (three to 13.2 pounds) (Angerbjörn 2004). They tend to be larger in size than rabbits, and with longer legs and ears, and they tend to run faster than rabbits. 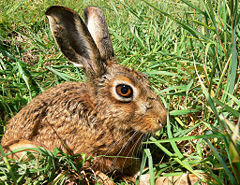 The European Brown Hare (Lepus europaeus) can run at speeds of up to 72 km/h (45 mph). Hares are clearly distinguished from rabbits in that rabbits are altricial, having young that are born blind and hairless, whereas hares are born with hair and are able to see (precocial). Very young hares, less than one year old, are known as leverets. Hares and rabbits are found in most parts of the world, including Europe, Africa, Asia, and the Americas, but are not found naturally in Australia, New Zealand and other Oceania islands, Madagascar, southern South America, and most of Amazonia (Smith 2004; Angerbjörn 2004). Additionally, Hares and rabbits have been introduced into Australia, New Zealand, Java, southern South America, and over 500 oceanic islands (Smith 2004). European hares have been introduced into Argentina, Ireland, New Zealand, Australia, Scandinavia, and southern Siberia (Angerbjörn 2004). Hares, being fast running, tend to inhabit more open areas, ranging from arctic tundra to deserts to grasslands (Angerbjörn 2004). The European hares are naturally found in open terrain from arid steppes to forest steppes (Angerbjörn 2004). In such a habitat, they can elude predators with their running speed, although they also take advantage of camouflage with their brown or gray fur among shrubs and rocks (Angerbjörn 2004). While most rabbits are found in forest and shrubs, where they can hide, and hares are more common to open areas, the snowshoe hare and some mountain hares and Manchurian hares typically inhabit mixed forests or coniferous forests (Angerbjörn 2004). Most hares live solitary, although they may congregate during mating season (Angerbjörn 2004). A "drove of hares" is the collective noun for a group of hares. Males and females are promiscuous, not forming lasting pair-bonds, but rather mating with different individuals. Normally a shy animal, the European brown hare changes its behavior in spring, when hares can be seen in broad daylight chasing one another around meadows; this appears to be competition between males to attain dominance (and hence more access to breeding females). During this spring frenzy, hares can be seen "boxing"; one hare striking another with its paws (probably the origin of the term "mad as a March hare"). For a long time, it had been thought that this was inter-male competition, but closer observation has revealed that it is usually a female hitting a male, which is speculated to demonstrate either that she is not yet quite ready to mate or as a test of his determination. Hares may travel considerable distances and have large home ranges, and tend to escape predators by running away; this is in contrast to rabbits that tend to stay in the vicinity of safe hiding places in home ranges or territories and to escape predation by running into burrows and holes (Angerbjörn 2004). Many species of hares and rabbits have distress calls or thump their hind feet to warn of predators (Angerbjörn 2004). The large, laterally set eyes of hares and rabbits provide a nearly circular field of vision, which allows them to detect motion and avoid predators (Smith 2004). Hares have a keen ability to detect odors and communicate largely through the sense of smell (Smith 2004). Utilizing glands on their cheeks, groin, or chin, they rub pheromones on their fur during grooming and deposit scent marks on rocks or shrubs, or use urine or feces to leave scent markings (Smith 2004). Such odors advertise their reproductive status or mark territories (Smith 2004). The hare's diet is very similar to the rabbit's. They are strictly herbivores that feed by grazing on plants such as grasses, clover, and dandelions, and parts such as leaves, twigs, buds, bark of young trees, roots, and seeds (Angerbjörn 2004). The diet of hares and rabbits contains large amounts of cellulose, which is hard to digest. Lagomorphs solve this problem by coprophagia—ingesting their own droppings (feces). As hindgut digesters, most of their digestion takes place in their large intestine and caecum. A soft feces is excreted from the caecum and reingested and then digested in the stomach and small intestine (Smith 2004). Lagomorphs also produce hard round dry pellets, separated in the digestive system by a mechanical separation, and generally consisting of poorer quality particles; these hard pellets are passed quickly (Smith 2004). While literature often states that hard pellets are not eaten, research has shown that lagomorphs also regularly eat hard feces (Smith 2004). Basically, leporids tend to feed on fresh food during the evening and night and excrete the hard and soft feces during the day and reingest them (Smith 2004). Hares do not bear their young below ground in a burrow or warrens (interconnected maze of burrows) as do other Leporidae, but rather in a shallow depression or flattened nest of grass called a form. Hares are adapted to the lack of physical protection, relative to that afforded by a burrow, by being born fully furred and with eyes open. They are hence able to fend for themselves very quickly after birth—that is to say, they are precocial. By contrast, the related rabbits are altricial, having young that are born blind and hairless. Most hares produce many offspring each year, although scarcity of resources may cause this potential to be suppressed. Hares generally are able to breed at a young age, and many regularly conceive litters of several young, often doing so four or five times a year (Smith 2004). However, in the far north, native hares may conceive only one large litter a year, and in desert situations some hares may have small liter sizes (one to three young) given the lack of resources, although the desert hares may produce four to seven litters a year (Smith 2004). Hares have a relatively long gestation period relative to rabbits, lasting about 40 days (Smith 2004). European hares, Lepus europaeus, exhibit an interesting reproductive phenomena known as superfetation, whereby a late pregnancy female can mate, ovulate, and be impregnated and thus have two litters of different ages in her uterus at one time (Smith 2004). The European hare also has an elaborate courtship pattern involving large mating groups that aggregate, from which animals pair off, and are faithful and live together for about one month (Smith 2004). There is an extended courtship ritual, followed by brief copulation (less than ten seconds). Hares do not provide much parental care for their young. The mothers may nurse their young only one time a day, for a few minutes, although the milk is highly nutritious. This rare attention to the young may be an adaptation to reduce the likelihood of predators finding the juveniles (Angerbjörn 2004). "How to allure the Hare." Facsimile of a Miniature in the Manuscript of Phoebus (fifteenth century). Like rabbits, hares are ecologically important, especially as a food source, while humans derive economic, culinary, recreational, and aesthetic benefits from them. Hares are integral to food chains, consuming considerable quantities of plant matter and providing food for such animals as foxes, raptors, lynxes, ferrets, and raccoons. Economically, snowshoe hares have been particularly important in the fur trade, especially in Canada, with records of their pelts from logs of the Hudson Bay Company tracing to the early 1800s (Smith 2004). 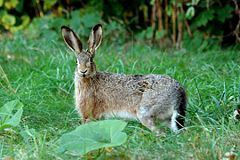 Historically, humans in diverse parts of the world have counted hares as an important food source, and people from England to China have hunted them for sport. The hare also appears in folk tales. In African folk tales, the hare is a trickster; some of the stories about the hare were retold among African slaves in America, and are the basis of the Brer Rabbit stories. Many cultures, including the Indian and Japanese, see a hare in the pattern of dark patches in the moon. One of Aesops fables tells the story of 'The Tortoise and the Hare'. According to Jewish tradition, the hare is among four mammals deemed not Kosher. The hare has given rise to local place names, as they can often be repeatedly observed over many years in favored localities. An example in Scotland is 'Murchland', the Scots for a hare being "Murchen" (Warrack 1986). Angerbjörn, A. 2004. Hares and rabbits (Leporidae). Pages 505 to 516 in B. Grzimek et al., Grzimek's Animal Life Encyclopedia, 2nd edition, vol. 16, mammals V. Detroit, MI: Thomson/Gale. ISBN 0787657921. Hoffmann, R. S., and A. T. Smith. 2005. Hares. Pages 195 to 205 in D. E. Wilson and D. M. Reeder, eds., Mammal Species of the World, 3rd edition. Johns Hopkins University Press. ISBN 0801882214. Smith, A. T. 2004. Lagomorpha (Pikas, rabbits, and hares). Pages 479 to 489 in B. Grzimek et al., Grzimek's Animal Life Encyclopedia, 2nd edition, vol. 16, mammals V. Detroit, MI: Thomson/Gale. ISBN 0787657921. Warrack, A. 1986. Chambers Scots Dictionary. Edinburgh: Chambers. This page was last modified on 5 September 2008, at 20:14.